Natural and durable window coverings. The classic elegance of both paint and rich wood stains add to the warmth and beauty of any room. Our wood blinds provide exciting design solutions for any style/scheme. 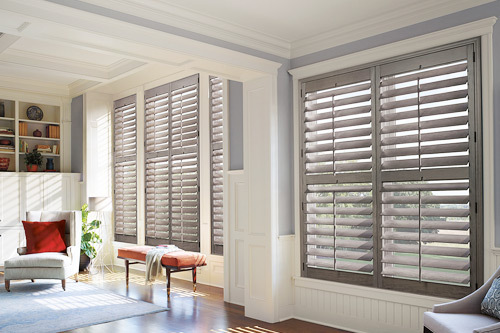 Shutters bring you the warmth of classic southern-style shutters in both 2 1/2″ and 3 1/2″ louvers in three colors. The panels with louvers are hinged to a frame that is mounted directly to the window frame or wall. The louvers are often opened for view, air and light. Ignite your creative fire with beautiful Roman Shade fabrics available in a variety of styles and colors. Whether you're looking for a classic flat shade for a clean, relaxed look, or a teardrop variety for a bolder style with added dimension, Roman Shades make any room look and feel more distinctive. Softwood blinds have the look of real wood blinds and are available in a variety of whites and wood tones. Softwood blinds handle humidity like no other blind and require little maintenance. They are the perfect choice for your window decor. Roller shades are traditional window coverings that offer countless decorative fabrics, styles, and options to suit a variety of needs. They provide elegant window treatments for a home, to heavy duty shades for offices, restaurants, or any other business. 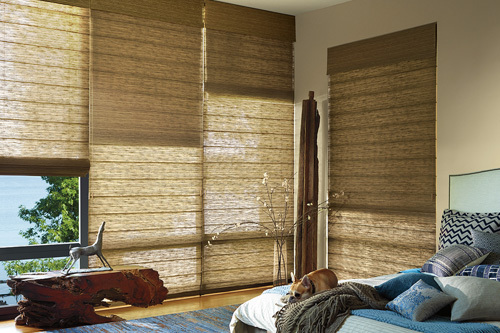 Shades offer a stylish alternative to horizontal or vertical blinds and feature a wide assortment of fabrics, including solids, prints and textures. Fabrics range in opacity from sheer to room darkening and can be manufactured in a variety of special shapes. We have custom draperies, cornice boxes, swags and cascades. We carry decorator rods, traverse rods and thousands of patterns and colors to choose from. Our draperies are all custom made and professionally installed. If you can think it, we can make it. Welcome the new, natural works of our Melhanna Woven Wood Shades a casually elegant collection of carefully selected bamboos, rattan, reeds, jutes, and woods. These beautiful natural materials offer great design flexibility, creating a custom ambiance. Family owned & operated since 1976, we bring to you elegance & design, more importantly excellent customer service.